I had so much fun in the first contest I'm ready for the next one already. Ok lets mix it up! Here is the setup for "Contest #2. Comment on the Post: Things I learned Along the Way to Divaism! (or Manism :-) with the most interesting thing you've learned along the way "That you can share!." And then Follow this blog so I can keep you updated on the contest. There will be a total of 3 Winners! I'm having so much fun this may become a regular thing. Now one other thing. Gifts are available for Women and Men! The Contest will end on Friday 7/24! All Winners will be notified within 48 hours of Contest End. Here is a pic of what the Winners from the first contest won. A handmade 100 Page Journal. 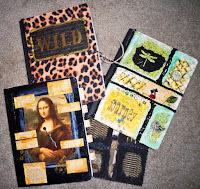 Unique Handmade Textured Journals that are fun and not only hold your thoughts but make it a great experience to Journal! This is only one of the gifts from the next Contest! Sterling Silver, Agate and Jasper! please let me know in your comment!